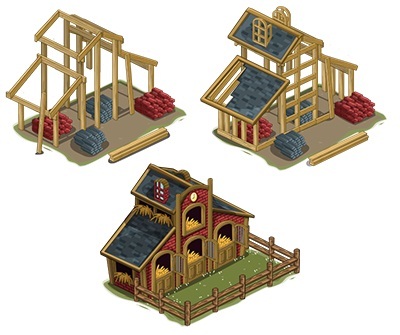 Create new horses with the release of FarmVille Horse Hall. This will be the next breeding lab in FarmVille as players will have to collect horseshoes to create and unlock new horses. Same idea with other lab, the Horse Hall when completed will start with an initial horse that may be harvested for Silver Horseshoes. Then as you harvest and collect horseshoes you will be then save enough parts to create and unlock the next horse. Here are on this guide you will find which horse will be producing the color of horseshoes that you will be needing and what color of horseshoes required to create new horses. I don’t understand how to start this. I’ve constructed the hall but usually the game gives you what you need to make the first animal, and then you get more items from that. That didn’t happen here, so I have to get silver horseshoes from my friends, and they’re very hard to claim. 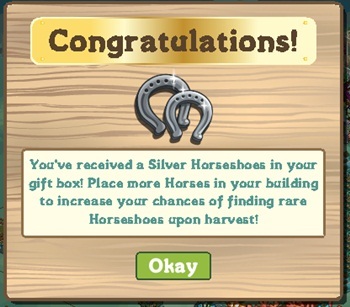 Is there another way to start getting silver horseshoes? Was I supposed to receive a horse when I completed the hall? I thought I might have placed the horse in one of my paddocks by mistake,since it wasn’t in the gift box. I have finished building a second hall on another farm, but I didn’t receive a horse for this one ether. Usually that’s the way it goes based on the previous Lab, once you completed the building it will have the initial parts as a reward for completing the building to create the first animal. If that’s the case, one of the reason we see this happens is because they offering this Red Sun Stallion at the Market for 30 FV cash which can be harvested for Silver Horseshoes. Currently there are only 3 that will produce Silver Horseshoes. The Space Horse, Sea Stallion and Red Sun Stallion. Thanks for the information acmclure, I solved the problem by buying five silver horseshoes for five FV cash and made the space horse. 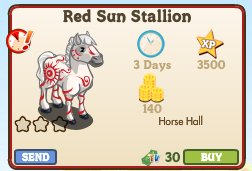 I didn’t have the 30 FV cash to buy the Red Sun Stallion. Well then this doesn’t work in the same way as other labs and FV should have said so somewhere! I was wondering too, why I wasn’t getting any of the silver horse shoes. I order to get the FV cash to buy the horse shoes, I watch every ad that pops up on farmville. Sometimes all the ad’s can be irritating when they pop up each time you go to another farm, but I have be able to get 2 to 3 farmville cash at a time this way. You can put any horse in Hall and they will start producing horseshoes without buying any with FC. I’ve got two Horse Halls built. Built them both on the first day of availability. I’ve just harvested them both having seen this message and ……. NOTHING, no horseshoes, nothing! No sign of the ‘Congratulations’ pop-up at all. Does this means it’s only going to work with Horse Halls built from now on? Are we going to have to demolish those which we’ve already built and start again? The congratulation message i posted was from the Horse Hall that is just built today. You don’t have to demolish you may use it for getting the other color (for horses that produces next to silver horseshoe). You may try to build another one if you have enough parts. Yes, you can now also get enough materials when you finished building it. They made an update. Hi i place horses on horse hall and i didn’t get any silver horseshoe only pixie dust how i do get silver horseshoe which horse i put it? rana, I did the same thing when I finished my first horse hall, I put a lot of horses in the stall,when I harvested it I got blue animal spirit instead of the horseshoe. After I made my space horse, I took all the rest of the horses out and put in the space horse. The next time that I harvested it I got a silver horseshoe. I had to buy the 5 horseshoes to make the horse, since I didn’t receive any when I finished the building. After building two horse halls and not receiving any horse shoes, I thought I would get it one more try. When I completed it today, I finally got horseshoes for building it. Now I wish I would have waited and not spent my FC on the first horse. That’s my issue too. 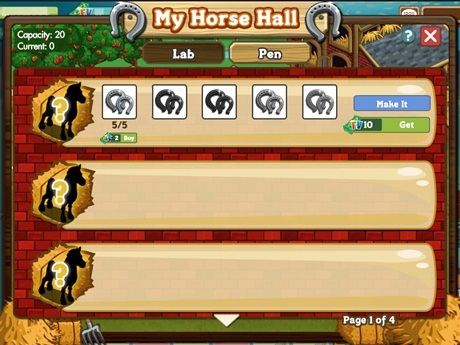 I finished my 2nd horse hall this morning and received 5 silver, but I only had 1 before, and that’s will harvesting my 1st hall several times over the last few days. 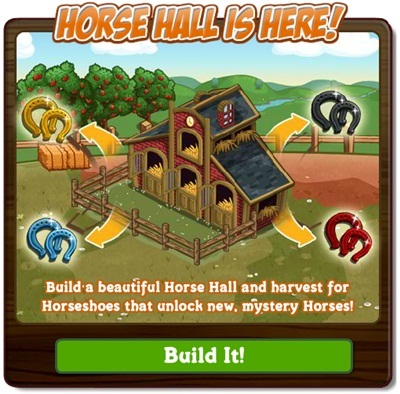 We receive 5 Silver Horseshoe as a reward for finishing a Horse Hall, what if we build another 2 Horse Hall to get a total of 10 Silver Horseshoe if we complete the 2 Horse Hall. We will now have enough Silver Horseshoes for the second horse. I have built several horse halls and they worked fine until yesterday. I have finished one and it recognizes that it does not need any more parts, but it won’t let me put any horse in it. So, I tried to build another horse hall on a different farm and it will only take one part and then I have to go back to my gift box. When it is “built” I get a “Whoa Farmer” and have to start all over. Are we limited to a certain number of horse halls? You may encountered a glitch or bug. It will return to normal. I have the space horse, plains pony & forest horse in the hall, I’m harvesting silver horseshoes, but no black ones. Any ideas? To get a Black Horseshoe you must remove all the Horses that is “NOT” producing Black Horseshoe. The Plains Pony produces Black Horseshoe so you may want leave that one “ALONE” in the Horse Hall. You may want also to build another Horse Hall to place the other producing Horseshoe color plus it will more efficient in producing the color you desire. Thanks, I’ll try it now! How do I get a Blue Moon Stallion, I don’t see it in the marketplace?? ?